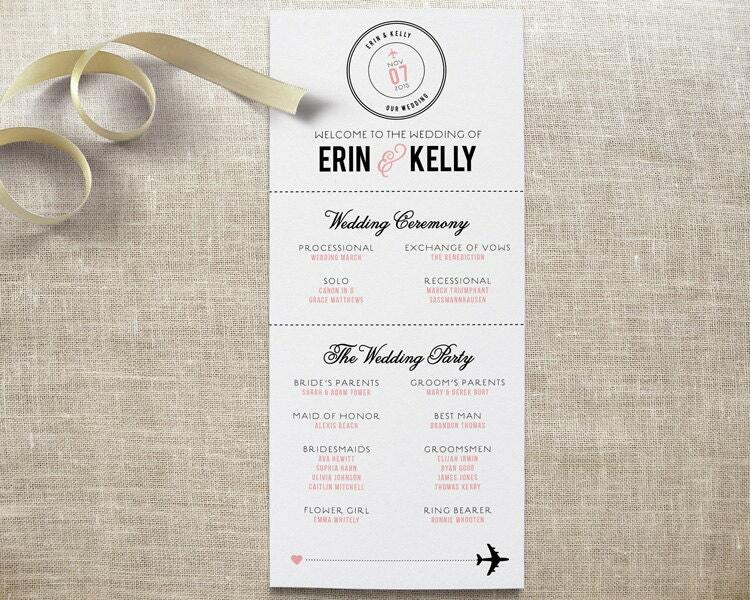 Let your guests know what's happening during your destination wedding ceremony and introduce them to your wedding party with this custom wedding program! PRINTABLE ORDER: PDF sent via email for you to print at home or elsewhere. No physical cards will be mailed to you unless you have selected a printed order, this product will be sent to the email address listed on your Etsy account within 2-3 business days. PRINTED ORDER: The $25.00 will act as a deposit towards physical, printed and finished cards that will be shipped to you. **Minimum order is quantity of 10 / $2.00 each. During the checkout process, please provide all the names, wording and info you'd like to go into layout in the "Note to Seller" area. I will take your information and create a digital, customized PDF proof for your review with your color preferences and personalized wording. Once you have approved the proof, printing & finishing will begin. Proofs will be emailed to you within 2 business days after you purchase. After reviewing your proofs, I'm happy to make 3 free revisions as you see fit. After that, additional fees may apply.